Today I bring another review for Essence Cosmetic. In the past, I've talked briefly about their lipsticks, lip glosses and the highlighter. Essence is a pretty well-known brand, but for those of you who don't know, it's originated from German and it basically sells makeup at this very affordable price. In Malaysia, you can find Essence at selected Watsons, AEON Big, Cosway, Parkson and Giant. Click [here] for store location. I know this might sound a little bit of stereotyping, I do however have short, sparse and hella pin straight Asian lashes. I think I've mentioned about it on my blog before. So, whenever I choose a mascara, I always look for something that will hold a curl, able to give lengthening effect, and also volumizing. Is this mascara a yeahhhh or nahhhhh? Keep reading to find out! What it says on the official website? 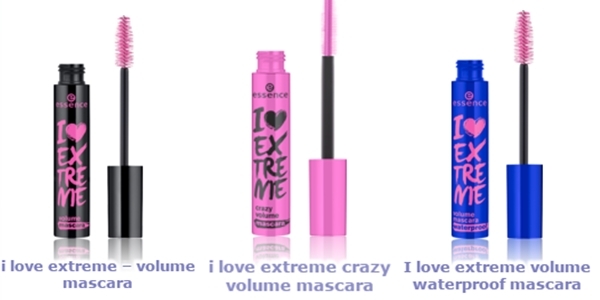 "The I Love Extreme Mascara's "crazy" sister- for even more volume. The deep black, creamy texture covers each individual lash with colour and the extra-large plastic brush provides sensational volume. The mascara container is designed in the usual I Love Colors, except they're the other way around in a cool pink with black lettering. Ophthalmologically tested." Here's the full range of "I Love Extreme" Mascara. Aqua (Water), Carnauba (Copernicia Cerifera) Wax, Cera Alba (Beeswax), Butylene Glycol, Stearic Acid, VP/Eicosene Copolymer, Palmitic Acid, Polybutene, Glyceryl Stearate, Acacia Senegal Gum, Candelilla (Euphorbia Cerifera) Wax, PVP, Caprylyl Glycol, Polyvinyl Alcohol, Aminomethyl Propanol, Sodium Dehydroacetate, Phenoxyethanol, CI 77499 (Iron Oxides). -Please take note that this is not a vegan-friendly mascara, beeswax is used as one of the main ingredients. However, Essence on the other hand is still a 100% cruelty-free brand. -Beeswax, together with Carnauba and Candelilla Wax are used to keep the oil (stearic acid, palmitic acid) and liquid (mainly water) formulation from separating. These naturally sourced waxes also help in maintaining the mascara's creamy consistency. 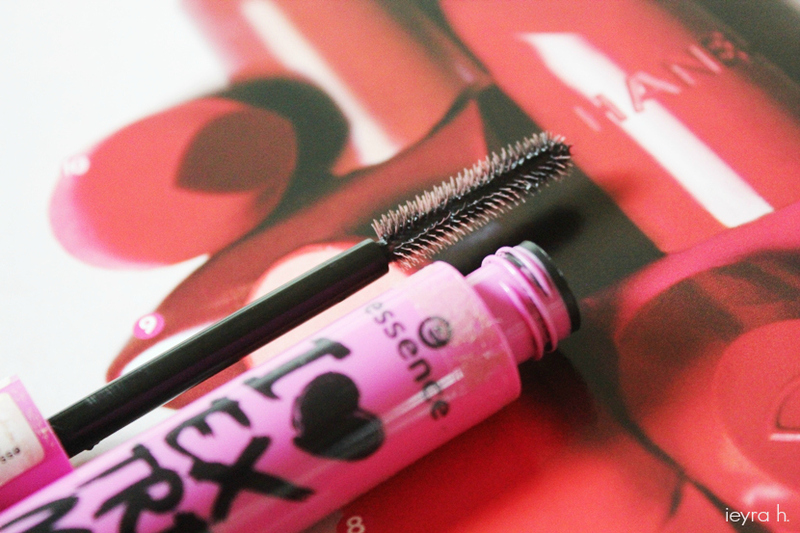 Essence already stated that the I Love Extreme Mascara has a creamy texture. -I'm not a chemist or cosmetic formulator, just a someone who has dealt enough with all these organic chemistry names during university, lol (and I'm also apparently a current cosmetic-ingredient-maniac, lol again). To be honest, this is my first time hearing about VP/Eicosene. It's quite a high listing in the ingredients list. Aku pun tak tahu apa benda neh, but apparently, this thing is common in lengthening mascara? -Polybutene gives the mascara tackifier feel. Hence the clump texture, a.k.a going to make your lashes full looking. -Acacia Senegal Gum (Arabic gum) is a natural thickening agent, usually found in non-waterproof mascara. Just like the previous ingredient mentioned, it's also one of the things that are able to make lashes looking long and plump. Are you guys still with me? okeh. -Just like my previous reviews, I have adopted CosDNA's rating system. It's based on a safety index from 1-9, with 1 being low in hazard. The top most alarming ingredient is Phenoxyethanol (4) while Acacia Senegal Gum and Aminomethyl Propanol are at (3). Phenoxyethanol could be irritant to eyes while Aminomethyl Propanol, a pH buffer has a bad reputation of giving contact dermatitis to some people. However, noticed that all these ingredients only listed toward the end of the list, and I believe they probably wouldn't exceed 2% of concentration. Does this mascara irritate me? Unfortunately yes, not always; only if I use it for very long hours, but performance wise, I like it and I will tell you why. Almost a year. Judge me all you want. LOL. I'm not good at following the "three to six months" mascara rule. I throw mine away if I see them dried, smell funky, or starting to irritate my eyes. 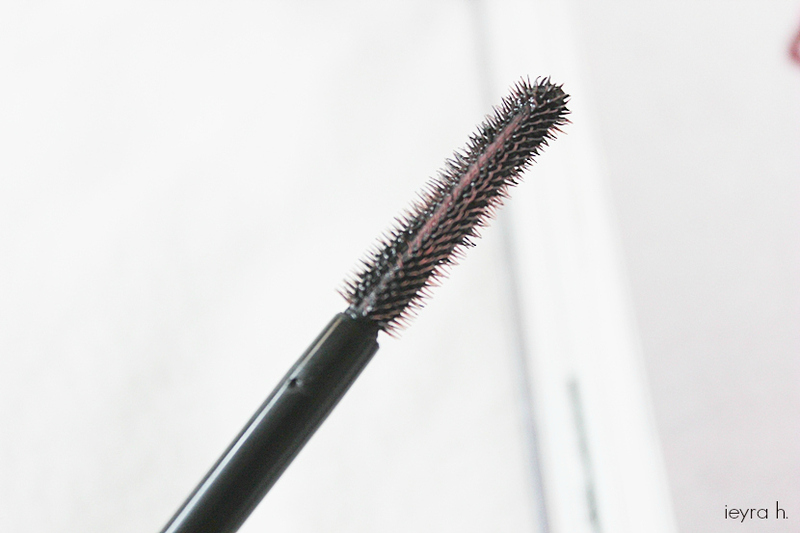 The tube is quite huge and it's in bright pink colour- so easy to distinguish from other mascaras in my stash. The wording doesn't come off at all even though I have it for quite some times. As you can see, the wand is straight and narrow meaning that the mascara is meant to be for lengthening. Bristle is short making application easier to control. I like it that way since it could lessen the tendency of poking my eyes (HELLO BENEFIT REAL LASHES MASCARA I AM LOOKING AT YOU). 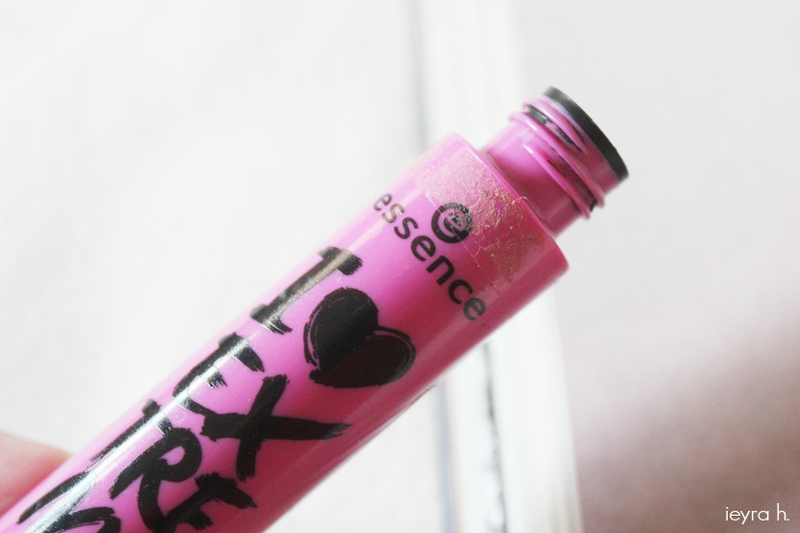 Also, technically, this Essence mascara is able to provide volumizing effect since the bristle is densely packed. Wet and creamy. There's a possibility of lashes getting clumpy and ended up giving spidery look. Creamy formulation of mascara would mean it doesn't dry that quickly. I have no problem reaching out the innermost of my lashes while using Essence I Love Extreme Mascara, so that's good. In term of wearing, I always prefer to use it with 3 coats, without waiting for them to dry within coats. It gives the falsie effect and I do too feel like I'm wearing lashes. You know the heavy feeling you get sometimes after applying mascara? I always feel that way whenever I put this mascara on. And it makes my lashes become stiff, even after one coat. Minor smudging after long hours of wearing. A bit, after a while. So-So. I didn't expect much though since it's not a waterproof mascara. Essence made one in blue tube waterproof but I couldn't seem to find it at nearest Watsons. Well, I don't remember the last time I have a bi-phase makeup remover inside my drawer because I always use micellar water. And to that, it's a little bit hard to remove even though this version is not waterproof. Be careful not to get it onto skin when you're doing your makeup. In short, I really like the Essence I Love Extreme Mascara. Just like the name, it's indeed giving the extreme falsie look. It lengthens and pumps up my lashes impressively although without a precise lash separation. This is also one and only mascara in my collection that able to give me a little bit of the curl without having the need of curling my lashes. Yes. But these days hard to find one lerh. if you don't wear falsie but still want a mascara that could provide you with dramatic length+volume without having the need of spending extra bucks. It's cheap, less than RM20. if you sobs easily when watching a sad movie in the cinema. if you're a vegan. Also if you don't like that clumpy lashes look. (1) In store- Selected Watsons Pharmacy, AEON Big, Cosway, Parkson & Giant Hypermarket. Oooo, 8/10 that's pretty good rating.. I want to try this! Nice! Siqah guna maybeline je. Itu pun bertahun baru habis. Hahaha.